Poor cauliflower, the most misunderstood vegetable of all. I think they’re amazing and I’m not just saying that because today’s recipe features them heavily. I hated cauliflower when I was growing up. My Mum used to serve it as an after-thought, anaemic and boiled to death. It’s actually pretty versatile and makes a great base for many dishes. As a frequent low-carber, it’s saved my backside numerous times, making a fairly convincing substitute for fried rice (grated) and pizza dough! But in more regular, daily use, the cauliflower is at its best when combined with cheese and bacon. Mmmm, bacon. When I make Cauliflower Cheese, I make a big’un as it keeps very well in the fridge, you may want to half the quantities or just live off it for a week like we usually do. 1). Break the cauliflower into florets trying to keep them reasonably large in size and place them in glass bowl with a few tbsp of water in the bottom. Cover with a vented lid (clingfilm with holes poked through or microwave cover) and pop in the microwave for around 6 minutes until just tender (test with a fork). You could of course boil or steam in a traditional steamer… but I’m being lazy remember. 2). Cook the carrots with the same method and just check occasionally with a fork until they’re *just* tender. 3). Fry the onion and bacon until crispy and set aside. 4). Using a food processor, blitz the cheese, mustard, nutmeg and evaporated milk together. 5). 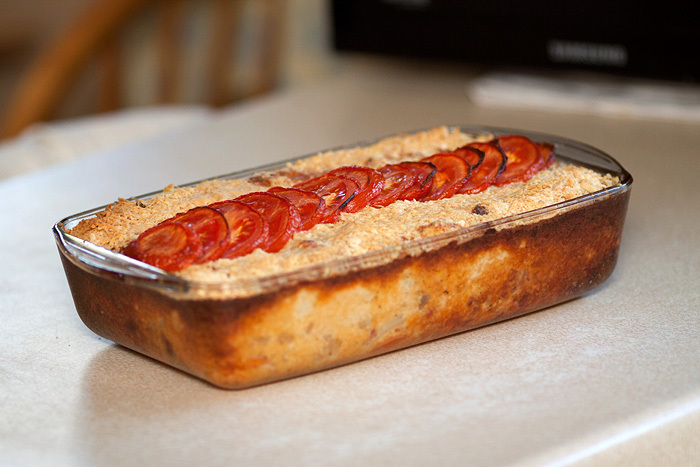 Grab a large ovenware dish (no need to grease it), and add the cauli, carrots, fried onion and bacon. 6). Pour over the faux cheese sauce. 7). 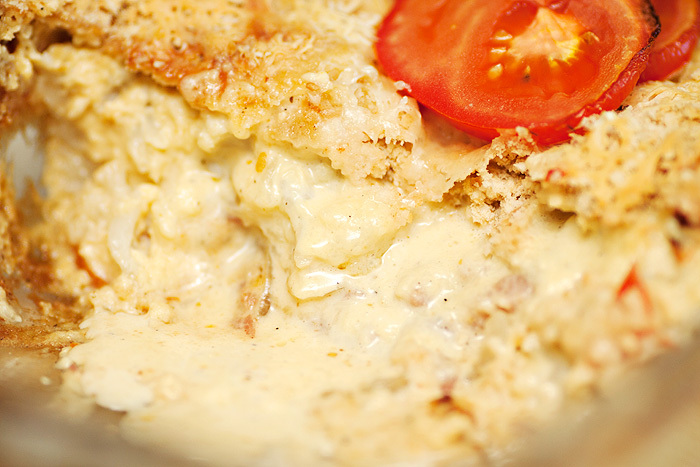 Scatter the breadcrumbs and grated cheese before layering the sliced tomatoes ‘prettily’ on top. 8). Bake in the oven at 180 degrees Celsius for around 25 minutes, or forget about it and remember after 35 minutes to get it a bit burnt around the edges like mine. Personally, I slightly prefer my Cauliflower Cheese with a proper roux base. Mr. L prefers it this way. L doesn’t care as-long as she gets more bacon bits than anyone else. Lazy Cauliflower Cheese without the efforts of a homemade cheese sauce. Bliss. This looks delicious. I love Cauli Cheese and what’s not to love about the addition of bacon. Yum! OH MY GOD!!!!! <3 I love califlower cheese.. its the only way i can eat califlower! Ooooh, yummy, I love cauliflower cheese. I also like stuff you can live off for a week as I’m a right lazy bugger. I’ll be trying this next week, methinks! Looks lovely, then again, anything with the words ‘Bacon’ and ‘Cheese’ in the title and I’m sold! This is the Chanel of casseroles. I called my husband (the house chef) to read the recipe and he swooned. We are both dieting (how silly of us) but this may be worth breaking our fast. Fingers crossed that the Yanks can translate metric. PS: Love, love, love your blog.